JNN 22 Apr 2015 Frankfurt : A mosque was set on fire in Germany on Tuesday morning in the university city of Witten, located in the district of North Rhine-Westphalia. Another Mosque was vandalized in Oklahama, US . German daily DerWesten reported that an identified man was filmed from inside the mosque on Monday night at around 23:30 local time entering the mosque and pouring the contents of a gasoline can in the prayer room. After he reportedly set the gasoline on fire, he fled the scene using the entrance gate of the mosque. The man was reported to have entered the building from the back, via its window. There were four families with children living in the building, but fortunately, the fire extinguished by itself. One of those living in the mosque, Veysel Arslan discovered that the smoke had filled the praying room as he woke up to morning prayer. The police seized the crime scene and experts are examining the burn marks. Xenophobic attack has not been excluded from the investigation. In recent months acts of Islamophobia have been on the rise in Germany. Before Sunday prayer service, raw bacon was discovered by a child at a local mosque in Edmond, US State of Oklahoma. “I always felt safe here. I always felt it was a comfortable place to go,” Adam Soltani, Council on American-Islamic Relations (CAIR) executive director, said. On Sunday, vandals tossed bacon along the doorway of an Edmond mosque near the University of Central Oklahoma. “Someone would have to know that according to the Islamic faith, pork is not allowed for Muslims to eat, so it sends a message that they know that and that they want to offend,” said Soltani. Students are shocked to see this happen in their community. “It’s really disgusting, actually. I just don’t understand why people would do that,” Erick Larson, a student at the University of Central Oklahoma, said. “Whenever we see a surge in anti-Muslim rhetoric and speech in a local community, it seems to be coupled with unfortunate incidents of hate crimes and vandalism,” Soltani said. This isn’t the first time a mosque has been targeted in the metro. In 2012, vandals shot paint balls at the Grand Mosque of Oklahoma City. 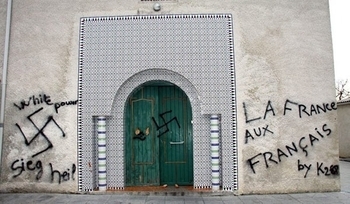 In 2013, surveillance video was released showing a suspect painting racial slurs on the walls of another metro mosque. Both were investigated as hate crimes. “I think with each incident, the concern grows even stronger,” Soltani said. The mosque filed a police report with Edmond. At the same time, CAIR has contacted the FBI in hopes they will investigate this latest incident. Abdallah Zekri, the head of the Observatory said in a statement that anti-Muslim acts rose by 500 percent, compared to the same period in 2011, the World Bulletin reported. “Never since the establishment of the Observatory in 2011 have Islamophobic acts known such an implosion of actions or threats, especially on social networks,” Zekri said. Zekri stated there were 222 anti-Muslims acts during the 1st quarter of 2015, (56 attacks and 166 threats) against a total of 37 acts in 2014 – ” An increase of 500 percent,” said Zekri. Zekri added that the number of anti-Muslims acts in January 2015 reached 178. He explained that the “burst” was mainly due to the deadly attack on the offices of the French satirical magazine Charlie Hebdo on Jan. 7, followed by a hostage situation in a kosher supermarket two days later, leaving a total 17 people dead. “However, those horrific and terrifying crimes cannot justify under any circumstances the steep rise of hatred or revenge against Muslims in France,” stressed Zekri. “They (Muslims of France) are not responsible or guilty of committing these terrorist acts that devastated the country,” he added. Zekri said the assaults targeted men and women, generally in public places and transportation, and in some instances pregnant women. He also said that in certain cases, targeting mainly places of worship , grenades and firearms had been used. “This is simply racism and rejection of men and women who aspire to just be respected,” said Zekri. “Does the motto of the Republic ‘Liberty, Equality, Fraternity’ make any sense? Unfortunately, the question (must be asked),” added Zekri. Zekri went on to accuse political leaders of remaining silent in the face of such an increase of anti-Muslim acts. “All this happens without any reaction from politicians, who, instead of denouncing, try to find excuses,” he said. Zekri said that the political silence fed radicalization and pushed youths to leave to join extremist and terrorist groups. This entry was posted in Europe, United States and tagged Adam Soltani, France Abdallah Zekri, Islamophobia, morning prayer, Mosque, Mosque Vandalized, North Rhine-Westphalia, Oklahama, Oklahoma, Oklahoma Mosque. Bookmark the permalink.